Taken one week after the illegal discharge, pictures of cans and chemicals. Eleven months after a San Luis Obispo city employee dumped toxic chemicals at a public facility, city officials have still not reported the illegal discharge to state authorities as required by law. The failure to report the spill could leave the city with fines totaling more than $1 million. 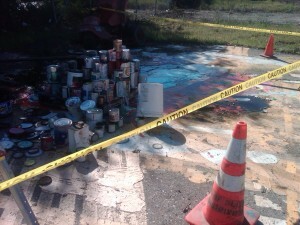 In mid January 2011, an angry city employee told several subordinates to pour out cans of acetones (solvents), varnish, epoxy, creosote, enamel paint and latex paint. The chemicals were dumped on an asphalt parking lot that abuts a grassy area. Paint and chemicals swirled together creating areas thick with paint and a lower section that included open soil coated with acetones, varnishes and creosotes. Waste water collections supervisor Bud Nance had told the staffers to remove the contents of the hazardous waste storage shed at the city corporation yard on Prado Road and empty cans in the yard. Banned substances include latex paints, oil based paints and solvents, according to the state’s website. Several of the chemicals poured out in the yard can affect health especially if leached into the ground or water supply. Nance refused to answer questions about the spill, hanging up during an interview. Solvents, varnish and creosote seeped from cans to a strip of wood separating the asphalt from the soil. Picture taken one week after discharge. Nance ordered the dumping because he was angry with the city, several employees including supervisors said. Nance’s supervisors had questioned him about his relationship with a female coworker. And, he was upset because the city had investigated and wrote up a friend, Ron Faria, for taking a city lawn mower, they said. City emails show fellow employees including Dave Hix, a San Luis Obispo wastewater division manager, chastising Nance for his actions. “Now look what you’ve done,” Hix said in a Feb. 2 email to Nance. Dowden replied that the training was required because the chemicals had been dumped. “The training component I offered up is a mandatory BMP (best management practice) after an illicit discharge of this nature, not only under San Luis Obispo’s permit, but under the EPA, DTSC, RCRA and etcetera regulations, so if utilities still doesn’t want the training that is up to you,” Dowden said in a Feb. 3 email to Nance. 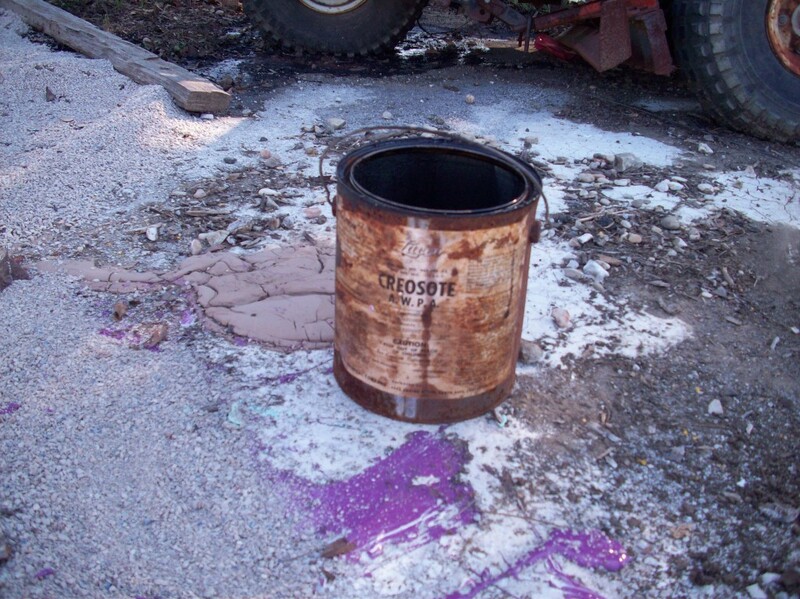 The state requires notice of accidental or deliberate spills of hazardous waste within 15 minutes. The purposeful release of hazardous waste including acetones, creosotes and enamel paints would need to be reported to the environmental protection agency regardless of the amount, according to the State Department of Toxic Substances Control. Failure to properly report a hazardous chemical spill includes a $25,000 a day fine until the incident is properly reported, state officials said. City officials have tried to keep mum about the spill. A string of emails show some San Luis Obispo city employees attempting to downplay or hide the problem. “As a follow-up to the incident concerning the illicit discharge of hazardous waste (i.e., paint) into the environment near a wetland at the back of the corporation yard by staff in Utilities, Freddy, myself and Kerry Boyle can put together some training for your staff concerning the proper containment, labeling, storing, inspection policies, leak containment and management and disposal of hazardous materials asap, so that we can avoid future incidences like the one that just occurred at the corporation yard in the future,” Dowdin says in an email to Dave Hix and three others on Feb. 2. Some city employees and management have taken a don’t tell or downplay stance, while others are concerned with the affect the spill and the cover-up could have on the city. 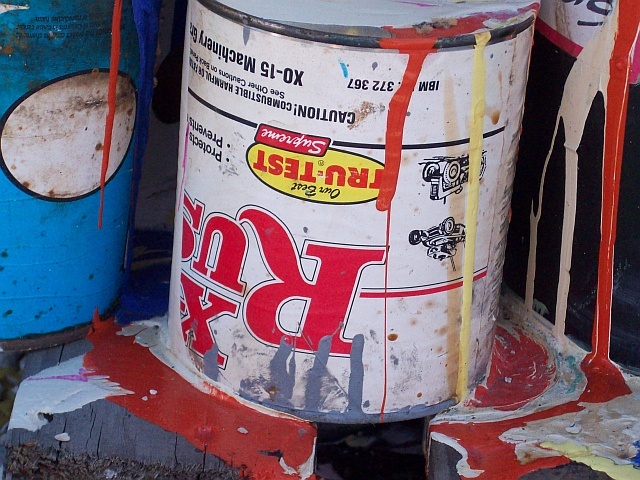 Nance and San Luis Obispo Fire Department Hazardous Materials Coordinator Kerry Boyle claim the cans were primarily latex paint and the spill was no big deal. But, photos and emails make it clear that it was much more than latex paint. One photo shows more than nine legible can labels; only one is latex paint. Other labels show epoxy, rust remover, stain and enamel paint. City Attorney Christine Dietrick called several employees, including Boyle, and ordered them to either refer all calls about the issue to her or to only interview via email, after learning of the CalCoastNews investigation. Employees said Dietrick was insistent that the dump consisted primarily of latex paint and was not large enough to mandate an official report. However, several upper level employees such as Tim Girvin, the city’s chief building official, say otherwise in emails following the illicit discharge. 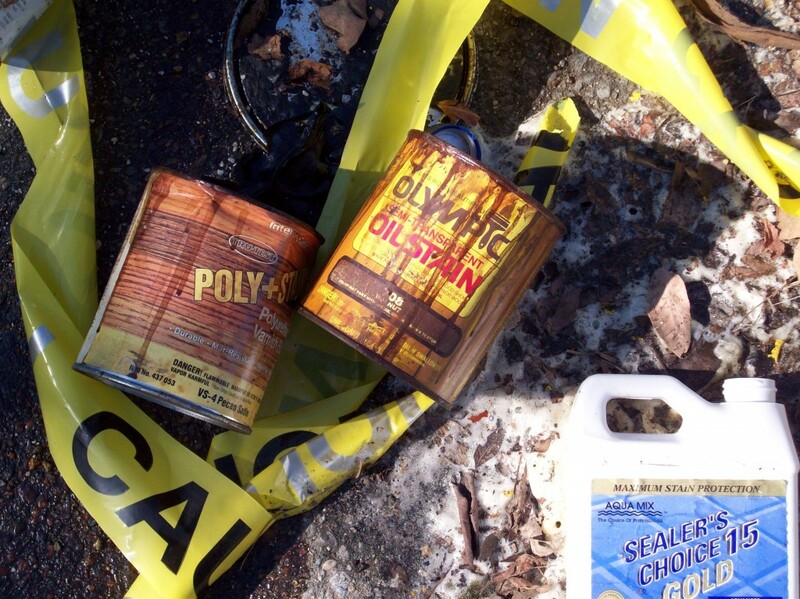 “This issue is clearly related to hazardous waste,” Girvin said in a Feb. 14 email. Two weeks after the chemicals were poured out on the ground, city management asked San Luis Obispo Fire Department Hazardous Materials Coordinator Kerry Boyle to inspect the site. Information from employees and dates on photos show the chemicals had been soaking into the ground for about two weeks before the city called the inspector. Boyle determined the release did not “meet a reporting threshold,” said Aaron LaBarre, supervising environmental health specialist for San Luis Obispo County Environmental Health Services. But, state law requires that intentional spills of hazardous waste be reported. Boyle said that it was not his job to report the spill. “Public works poured out the chemicals, it is their responsibility to report it, not mine, Boyle said. Pouring out chemicals on asphalt was “stupid,” Boyle told CalCoastNews. But, he claimed the spill was not large enough to make it to a local waterway that lies less than 200 feet from the dump site. He also said that he did not think the spill leached into the ground water. Other city experts said otherwise. “Acetones can pass through the asphalt and easily penetrate soil to reach ground water, said an employee who asked not to be named to protect his job. Up close picture of opened upside down can. Empty cans left strewn in the corporate yard. 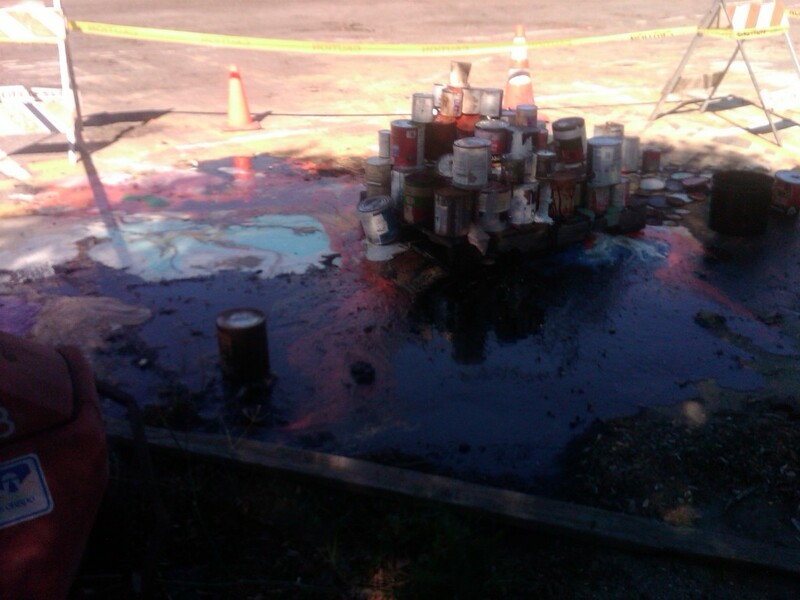 Workers poured out a gallon of creosote in the corporate yard. Two weeks after the illegal discharge, workers poured cat litter on top of the chemicals. So this person did this willingly and intentionally while throwing a temper tantrum. I would think that criminal and civil charges against Mr. Nance would be more than appropriate. People make mistakes but this, obviously, wasn’t a mistake. If this person is still working for the City then they should be responsible too. This is about as black and white as it gets. The place where Jesus was CRUCIFIED????? The employees that actually did the dirty deed are also to blame IMO. Everyone knows that you can’t you dump this stuff, they should have went above his head to prevent this from happening. And of course this nut should be fired. We need to make tough cut backs and getting rid of this guy makes it a bit easier to cut back. Your Measure Y funds at work. racket hit the nail on the head. No word in the article about Mr. Nance’s current salary and benefit package or the pension he will receive after a career of creating more expense for taxpayers. Only the brightest and the best for SLO! How about we replay this next time the moon suits show up en masse at a Paso rental where someone sold jonts and p*ssed on a used spray paint can in the back yard. If one tenth of that was found on private property during a big bust of, say, 2 marijuana plants the haz mat team would’ve spent $100k cleaning it up before then condeming the house. Yet when they are on the hook it’s no worries. Take a look at all those can’s that were dumped. This guy didn’t need a class on proper containment of hazardous materials, he is the hazard and needs containment himself in an institution. What is this? Why is he still collecting a pay check from the tax payers a year later? What about his superiors, they need classes on co-dependency and a swift boot to the unemployment department. This behavior isn’t even close to acceptable. This was malicious, intended contamination of soil and groundwater basin. How dysfunctional is this outfit, anyway? The manager tolerates this behavior, and does nothing but EDUCATE the worker? How do you “educate” a person not to participate in malicious behavior that causes environmental pollution? This is in the realm of a behavioral character fault. You cannot “teach” someone out of that kind of willingness to cause harm in the name of retribution for some perceived wrong. That is very dangerous behavior to have around toxic chemicals. The worker needs to be fired, his keys and everything else associated with his position taken from him, and he needs to be escorted from the premises by security. THEN they need to report him to the National Response Center for Toxic Spills (http://www.nrc.uscg.mil/nrchp.html) and the EPA Tip Center (http://www.epa.gov/epahome/violations.htm). Probably the same reason John Ryan Mason is still collecting a paycheck from the SLO City. OMG, I actually had to start laughing when I realized what is going on here. This is like a little kid that gets angry over someone mentioning his gf and does what???????? Then Daddy say’s. “now look what you’ve gone and done”! pairs to work for us? Actually they’re adults so the questions really is, how much are we paying these criminals and their enablers, I mean conspirators? I applaud the City doing its part to address unemployment with this. City workers cause a problem, City workers investigate a problem. Reports get written, things get filed. New protocols get developed. Everybody stays busy. Good for the economy, good for the people. I don’t think it’s so much about the reporting requirements (which are ridiculous), as it is that this guy is a real jerk, a hypocrite, and getting paid with our money. He is dangerously malicious in his response to a perceived wrong. In his position, he KNEW what he was doing. He did it, anyway, knowing the damage it could do. He needs to be fired immediately. I cannot believe the screwed-up thinking of the screwed-up SLO-City kind of thinking that has allowed this unstable person to continue working there! Oh, excuse me. My bad. How could I have possibly been so stupid as to think that SLO-City would shield the public from a dangerous worker? SLO-City is the city that not only shielded a SLO-FD firefighter after he viciously attacked a civilian (with the civilian needing 5 plates in his skull to stabilize his skull), they put the FF on a cush desk job. I wonder how much time was wasted in emails and discussion over this though.. Guy should’ve been fired by HIS supervisor and the whole thing over and done with a day, just like private industry.